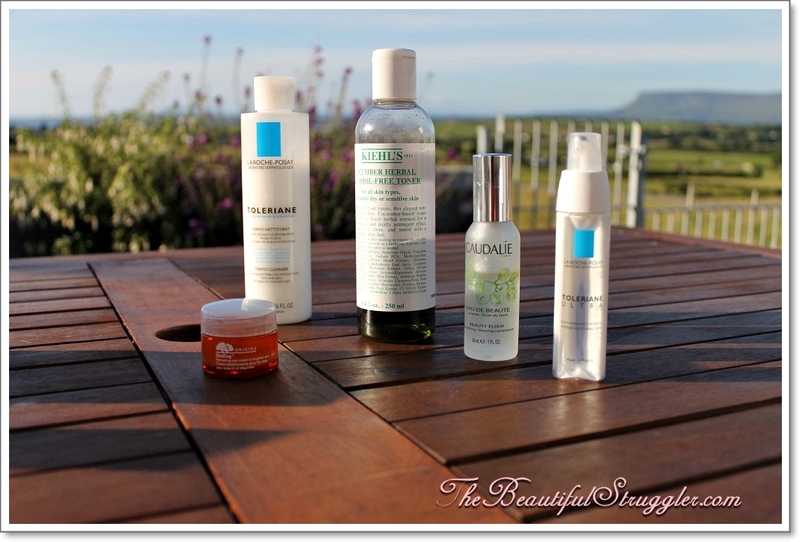 I’ve been meaning to do a post on my skincare routine for quite a while now. I have gradually introduced new products into the routine and continue using products that worked for me and gotten rid of those that don’t. As a result, I now have a fairly solid skincare routine that I have been using since january. It does seem like I use an insane amount of products but I have tried using barely anything to using even more than this as well as using extremely expensive products and extremely cheap products. What I have now is my happy medium and it has been working extremely well for me. (1)Using a facial wash in the morning just dries out my skin so I just cleanse instead. I use the La Roche Posay Toleriane cleanser and I find it both gentle and effective. (2)When I feel the need to, I follow that up with the Kiehls Cucumber Toner which is the gentlest toner I have ever used. (3)Most mornings, unless I have used the Kiehl’s toner, I will spritz my face with the Caudalie Beauty Elixir. I find it very refreshing although the smell does take a while to get used to. (4)While I wait for this to sink in I apply the Origins Ginzing eye cream to the eye area. I’ve been using this for most of the year and I must say, the longer I use it the more I like it. (5)Finally I apply my moisturiser, which is another La Roche Posay product, the Toleriane moisturiser. This is a fantastic moisturiser for dry skin, it’s thick yet still sinks in quickly enough to make it suitable for a daytime moisturiser. (1)The first thing I do is remove my make-up with Bioderma. Bioderma has been extremely hyped up in the beauty world this year and I have to say that it is definitely worth the hype. It removes all my make-up and is suitable for both face and eyes. It doesn’t sting my eyes which is something that usually happens me with make-up removers, so this is a real bonus for me obviously! (3)I then tone with the Kiehl’s cucumber toner. (4)Next if needed, I apply the Origins Super Spot Treatment to any spots or pre-spot areas. Sometimes I use tree tea oil, if the area is very sore or red. I mainly use the tea tree oil to clean any extra make – up from around my nose piercing. (5)About twice a week I use the Bio-oil on acne scarring to help it fade. I used to use it more, but the scarring is quite well faded at this stage. (6)Finally, the last two steps are the same as the morning routine – I apply Origins eye cream and La Roche Posay moisturiser. The extras are items such as exfoliators and masks that I use once to twice a week. My two favourite scrubs are Kiehl’s Pineapple and Papaya Facial Scrub and MAC’s Volcanic Ash Exfoliator. 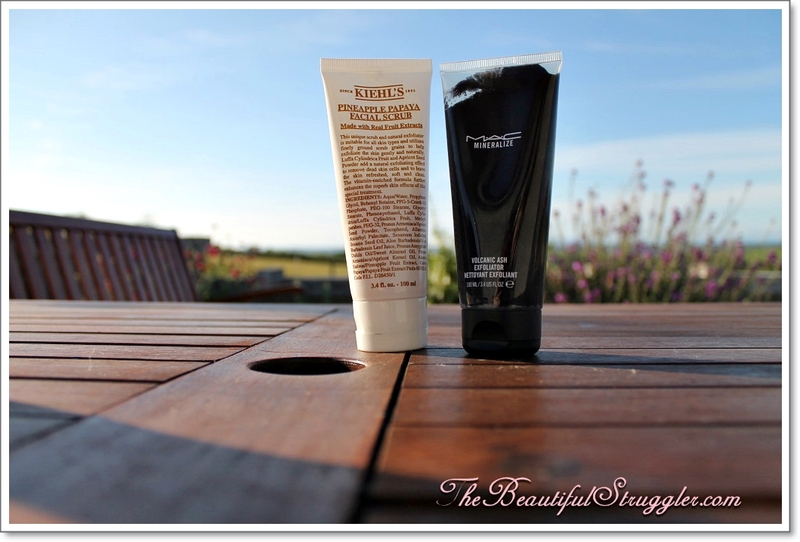 The Kiehls one is very gentle on the skin so I use that more often as it is less abrasive. When my skin needs it I use the MAC exfoliator as it is slightly harsher. It leaves my skin feeling very clean and refreshed. 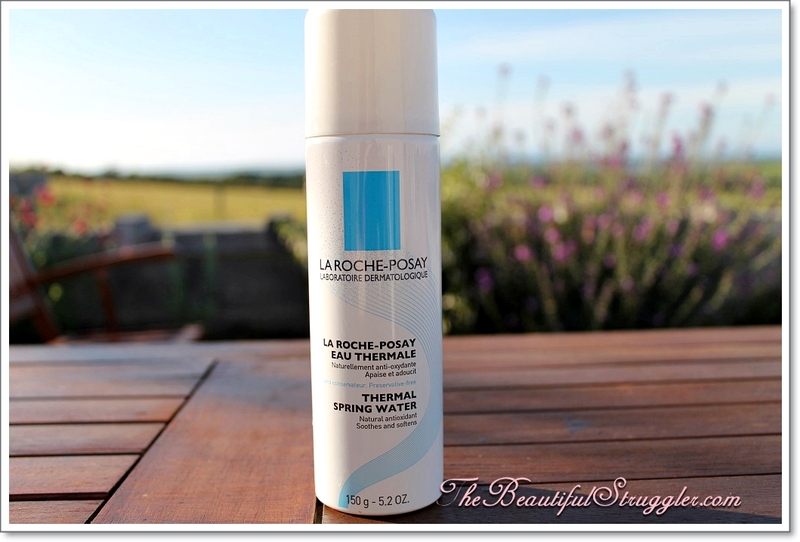 The La Roche Posay Eau Thermale spray is a refreshing spray that I spray liberally after using one of the exfoliators. I also sometimes use it instead of the Caudalie Beauty Elixir. Finally I have 2 masks that I like to use. The Boscia Black Mask is a proper mask that you leave on for about 15 minutes before peeling off. It is a product that I have instantly seen glowing results with. 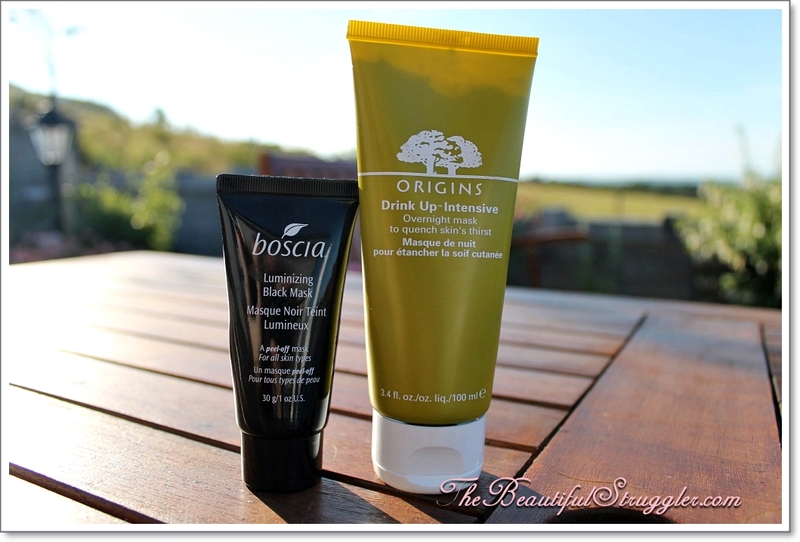 The Origins Drink Up Intensive mask is an overnight mask. It is basically like a thick moisturiser, it smells beautiful and works extremely well in hydrating my skin. Well done if you’ve made it to the end of the post!